OK, now I'm getting serious about building. This is your typical loose coupled set with a few more options I built in. I can't say the design is original by no means, What I did was take several ideas from several of the more reputable builders(Mike Peebles, Dan Petersen, Dave Schmarder) and put them together to make a really nice, versatile DXer that performs excellent. Starting with the ATU, I used 1/4 inch thick Plexiglas and 24 Guage wire. 45 wraps gives it about 190 uH according to my LCR meter. 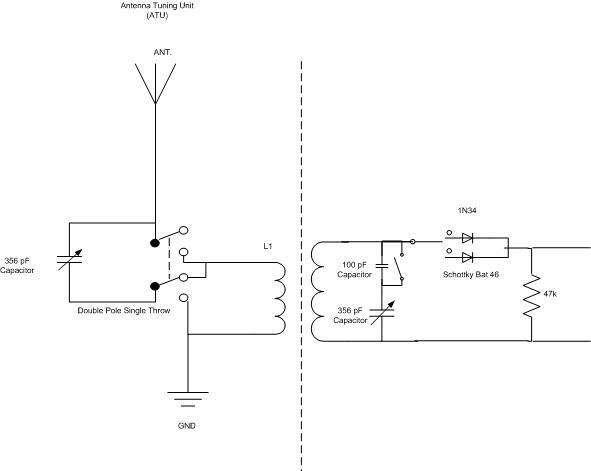 The capacitor is a 400pF and the DPST switch takes that capacitor from tuning the coil in parallel or putting it in series with the antenna (see schematic).